VANCOUVER - A proposed one-on-one televised debate between B.C. 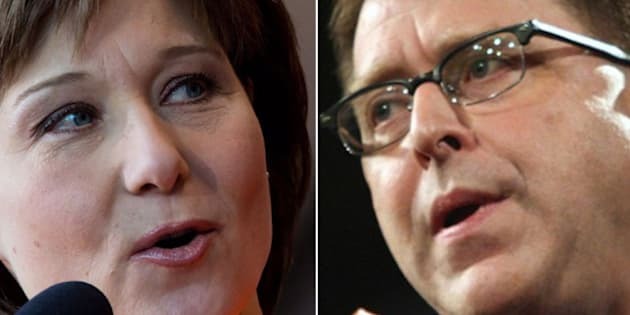 Premier Christy Clark and New Democrat Leader Adrian Dix has fallen apart because the NDP says other parties were excluded. The idea for the 90-minute debate originated with Global BC and was planned for May 6, just a week before British Columbians head to the polls. The townhall debate would have been in addition to other leaders' debates expected to be held during the election. While Clark accepted the challenge, Dix did not, citing its exclusivity, saying the leaders of the other parties have earned the right to participate. "I think to try and exclude the Conservative Party and Green Party who are also competing with me for votes is just wrong," Dix told reporters. He appeared to blame the Liberals for the exclusion. "The premier doesn't get to set the terms of the election campaign, and the Liberal party doesn't. This belongs to the people." Dix said the Liberals have shown no interest in debating their ideas, noting the fall session of the provincial legislature was cancelled. Meanwhile, the Liberals spent millions of dollars promoting themselves through advertisements paid for with "taxpayer money," said Dix, adding his party is going to ban the practice. Health Minister Margaret MacDiarmid, a Liberal candidate in the riding of Vancouver-Fairview, said in a statement that she was disappointed Dix turned down the faceoff. "This is a chance to have another debate featuring the two people who have the opportunity to be premier," said MacDiarmid in a statement. "The other leaders will participate in debates, but the opportunity for a one-on-one debate was something the NDP wanted in 2009 and now refuse to do." MacDiarmid said she thinks voters want to see Clark and Dix have a real debate, but instead of exchanging ideas the NDP is hiding its leader and policies. Global BC declined to comment on the issue and sent out a prepared statement. "As there is no agreement between the parties about a Global debate, we will not be saying anything or reporting anything on any platform at this time," said the statement. But according to an April 7, 2013 letter sent by Kenton Boston, vice-president of B.C. and national news for Shaw media, Global BC's owner, the debate was to be moderated by anchor Chris Gailus and play out in front of a live audience. "Global is requesting a head-to-head debate since the polls clearly indicate either the Liberals or the NDP will form the next government," stated Boston. "The Green and Conservative parties will be well represented in the consortium debate (of which we are a part) and will both receive significant coverage during the campaign." Boston said the station is confident it can develop a "compelling and relevant broadcast" that will help people make a wise decision on election day. "It would certainly allow both leaders to explain their top issues and their approach to government," he added. Clark accepted the offer "without condition" in an April 9 letter to Boston.